This in last week- another sombering reminder of the human impacts of the 2011 tsunamis washes ashore in Oregon. 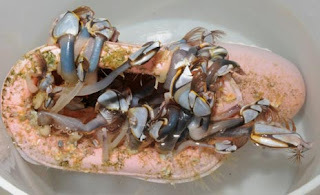 In Seaside, Oregon a slipper has washed ashore covered in sealife like pelagic barnacles and bryozoans and/or hydrozoa (the original article says hydrozoans, but I'm not entirely sure this is correct), typical of debris that has washed ashore so far. The slipper was brought into the Seaside Aquarium, where it was examined by staff. The slipper is just one of many personal items that have recently washed up, including clothing, toys, children's shoes, and plastic containers. The shoe had Japanese writing on the sole, confirming its origin. Back in 2012, it was speculated that human feet may begin to wash up with debris, as shoes may maintain the integrity of the limbs, representing a grizzly occurrence that has happened in the past with fresh or marine water deaths. Fortunately, this circumstance has not happened, and is not likely to, as most debris immediately sank following the tsunami. The chances of such a thing actually happening and then drifting across the ocean are very slim.